Adjustable beds and hospital beds share one common feature. They both allow the head and foot section of the bed to be adjusted. But that is where the similarity ends. Hospital beds are designed for people with serious medical issues and their caregivers. In addition to adjusting the head and foot of the bed, a hospital bed can be raised toward the ceiling and lowered close to the floor. This function helps save the backs of caregivers and helps to prevent the patient from injuries if they fall out of bed. 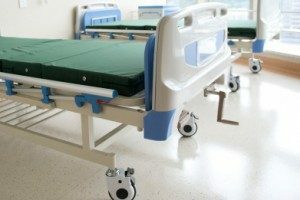 Hospital beds have large industrial wheels that allow them to be moved easily and quickly and come with built-in side rails that cannot be removed. The bed controls are usually built into the side rails or are accessed by a hand control that is wired to the bed. Hospital bed mattresses are generally six inches of foam covered with a thick vinyl to allow for scrubbing and disinfecting. Some hospital beds come with permanently installed institutional brown laminate head and footboards. Because they are designed for industrial use, hospital beds have bulky frames and are only available in twin sizes, which do not allow the patient to sleep with their partner. It is virtually impossible to disguise a hospital bed as a traditional flat bed. Today’s modern adjustable beds allow the user to elevate the head and foot sections of the bed to find positional comfort for a variety of health concerns. Adjustable beds allow users to benefit from the therapeutic features of adjustability without the negative stigma often associated with hospital beds. Adjustable beds are designed for use in the home and when placed in the flat position they look like any traditional bed. The users current head or footboard can be attached to the base allowing for a seamless transition with the owners current furnishings. Adjustable beds come in twin, full, queen and king sized mattress options allowing couples to continue to share a bed. Other specialty size options are also available. Adjustable bed mattresses are made to the exacting standards of today’s consumers and compare to all of the top brands on the market today. They are engineered to withstand thousands of adjustments and come in a variety of firmness levels. Adjustable beds come with options for both wired and wireless hand controls. Depending on the model chosen, users can program favorite positions into their controls for one touch adjustability. Depending on the model purchased, hand controls also operate advanced features on the bed. Advanced features on adjustable beds include the popular Headboard Glider™ Feature, Whisper Power® Motors, therapeutic massage and heat. Adjustable beds are the perfect solution for people looking for the health and comfort benefits of adjustability and Easy Rest has a full line of adjustable beds and adjustable mattresses to fit every need and budget. Fill out this form to download our Free Catalog and Better Sleep Guide.